Cut flowers are oh-so-yesterday. What has made it's overdue return is the concept of the gift plant. Traditionally gift plants were either incredibly easy to take care of or they bloomed profusely for a short time, giving a bust of cheerful color to the environment. One of my personal favorites has to be the lovely and very assessable African Violet. African Violets have so much going for them—inexpensive price, blooms that last for weeks, ease of care, they multiply and son on—there is a reason these were sold in supermarkets. They make a lovely housewarming, hostess and, in this case, Mothers Day gift that are quick to pick up and give. 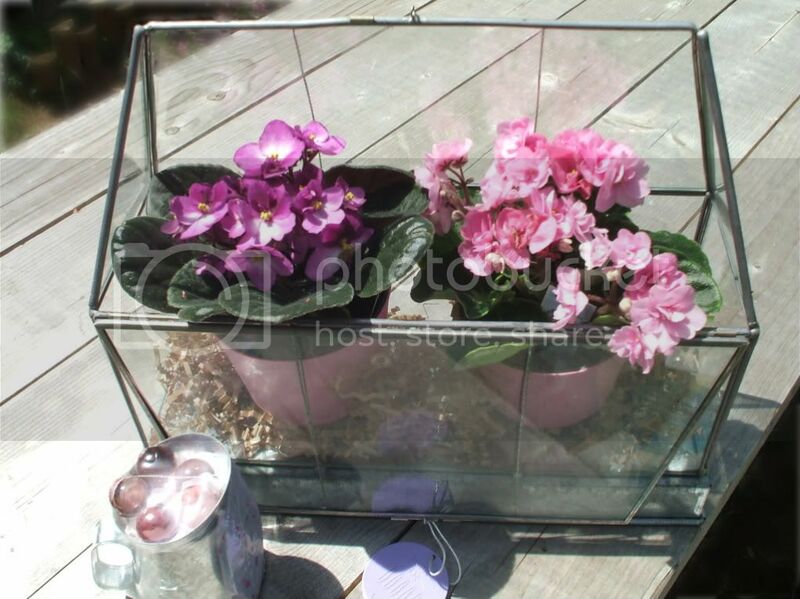 In order to take things up a notch I wanted to create a reusable way to give African Violets as seen here. I've also always been fascinated by Wardian cases of the Victorian era and have kept many variations over the years. So why not team the two up together? Miniature glass greenhouses come in many shapes and sizes not to mention price points. They're most commonly found in garden centers and florists shops but also check out antique shoes, boutiques catering to home decor, even your local supermarket or craft store such as Michaels cane stock them. If really pressed a large, empty glass hurricane lantern can also make a good substitution. When picking out your African Violets make sure that the soil they have been sitting in isn't bone dry or that leaves are starting to look badly wilted. African Violets are very susceptible to crown and leaf rot when they have been allowed to sit in water. Look for plants that have one crown and a rosette of leaves around the flowers. Plants that have too many sucker plants (baby plants form on the sides) can end up being extremely unruly and hard to get flowering again. For more on African Violet care check out Garden Web. Once your gift has been given your recipient can remove the violets and use the case for other more tropical plants such as Venus Fly Traps and miniature ferns. This will be our next DIY gift project so stay tuned! See the DIY planted terrarium here!